Home News Graffiti artist's mural tribute to town is a rail treat! Graffiti artist's mural tribute to town is a rail treat! 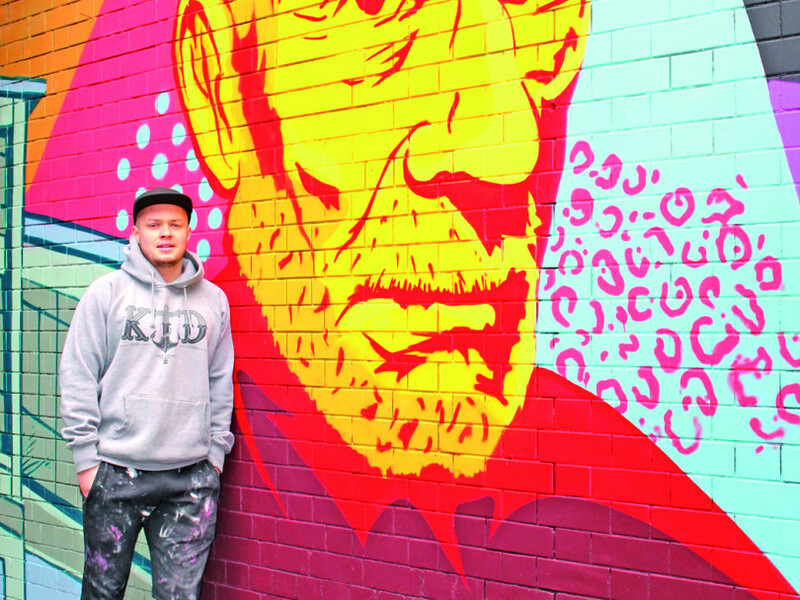 A GRAFFITI artist is brightening up Mirfield by painting a colourful mural of the town’s most famous attributes. Graphic designer Matty Evans has been commissioned by train company Grand Central to paint the full length of the wall opposite the entrance to Mirfield railway station. The 25-year-old explained that he was contacted by Ruth Edwards of the Mirfield in Bloom group who, along with the Friends of Mirfield Railway Station, had secured a grant of £2,500 from Grand Central to brighten up the tunnel. While he was given a brief that the images had to depict Mirfield, he said he wanted to paint it in his own style – which he describes as pop art. Images on the mural include familiar scenes and locations such as the old Black Bull pub, Mirfield Fire Station, and a portrait of Mirfield-born Hollywood star Sir Patrick Stewart, above right. Matty, who is from Mirfield and only does street art as a hobby, has spent the last four Saturdays working on the piece and hopes to have it completed in the next two weekends. He said: “I haven’t just done it for myself, I want people to see it. It’s a dark place and this brightens it up. They are trying to get another grant to put some more lights up on the opposite side to shine onto it so you can see it more. While the majority of Mirfield residents have been supportive, Matty has had the odd run-in with the law, despite having confirmation from Grand Central that he has been commissioned to do the work. He said: “They did tell Dewsbury Police Station but word hadn’t gone round so they came from Chickenley on a 999 call and blue-lighted down here. This Saturday just gone, I had the dogs unit and two police officers asking me what I was doing. Matty had previously worked on a mural in the same place back in 2013 with the help of a youth club. He is hoping Mirfield in Bloom and the Friends of Mirfield Railway Station will be successful in bidding for more funding to extend the mural to parts of the opposite wall.